It is a truth universally acknowledged that a gardener in possession of a lovely plant will not be in want of a friend. (Forgive me, Jane Austen). Okay, here’s the story. I promised myself when I started this blog that I would never post an ugly picture. 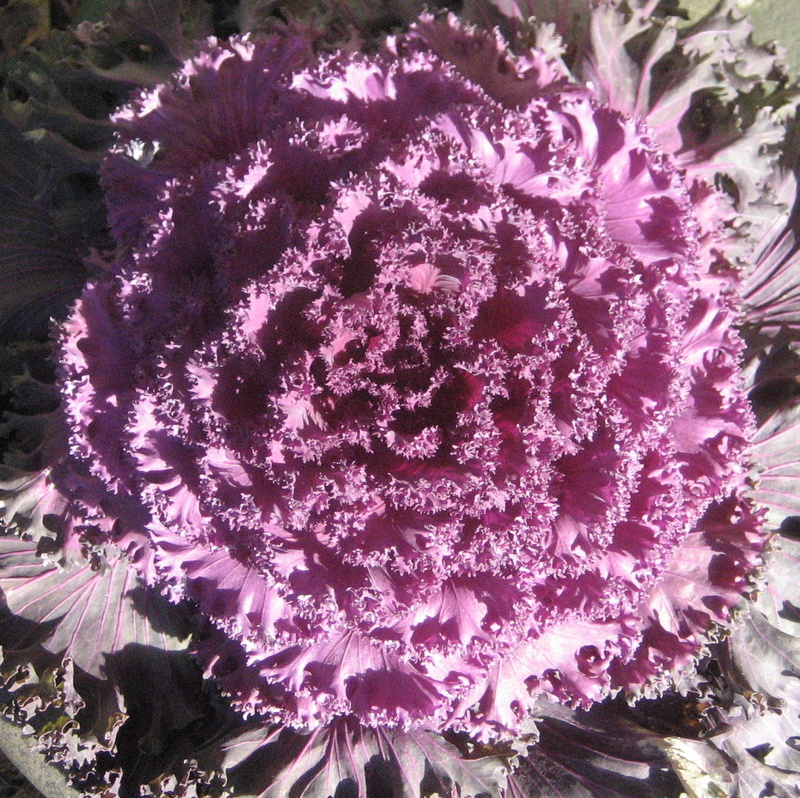 In my quest to find blooms around me even in January in Philadelphia, I knew I would want to address the ornamental cabbage. The problem lies in the fact that I, as rule, find ornamental cabbages quite unattractive. To me, they look faded and dirty and wilted. Especially the white ones. I kept my eyes peeled for said cabbages, anyway, tending to find them only in roadside beds in front of WholeFoods, the high rise condos, the cabinet company, the reformed temple, the outdoor mall. No pretty pictures to be had here. Never mind the fact that I would have to risk life and limb to park, get out of the car, and take a picture on the major thoroughfares of the Delaware Valley. I guess these establishments contract with landscaping companies to rip out the faded vincas or impatiens at the end of the growing season and plant up row upon row of ornamental cabbage. Winter color, hey, I love it. But these guys are just ugly. Or, so I thought until I took a nice, sunny walk around my neighborhood the other day. 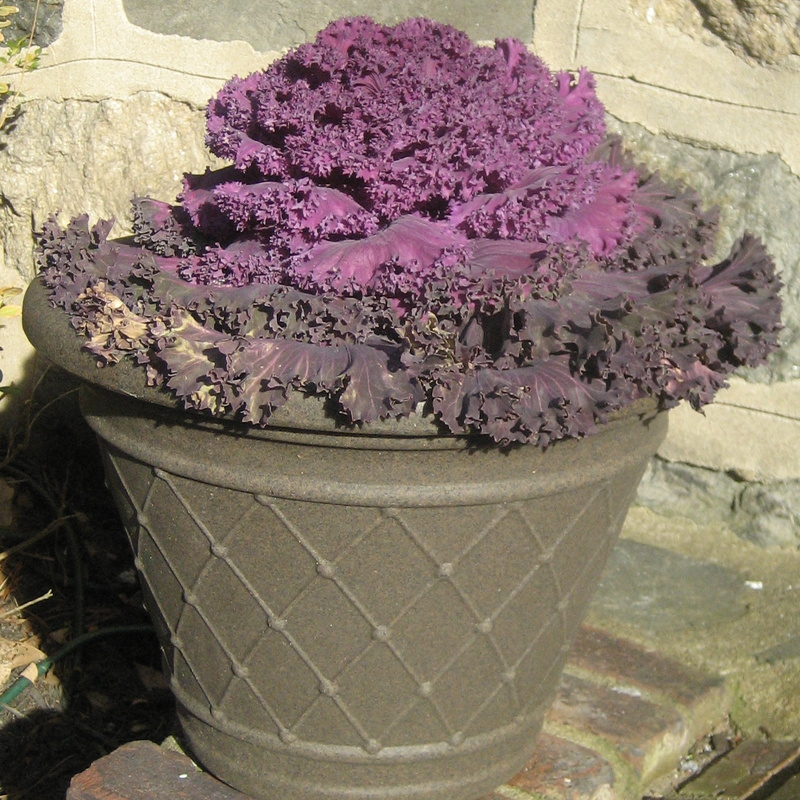 I had been searching for these cabbages (officially a kale species, fyi) in residential landscapes, but was coming up woefully short. They seemed resigned to their destiny as strip mall accessories. But there they were in front of a neighbor’s home, just two of them, thriving in pots perfectly sized and suited to their particular mounding growth habit. The containers lifted them off the ground and highlighted them as specimens, rather than trying to make them work as mass plantings. They flanked the front porch and actually looked pretty. Pretty enough to photograph, even. The car was in the driveway and the front door was ajar, so I figured I’d knock and ask permission to take a picture. I didn’t want any startled homeowner calling the cops because of the strange woman trapsing about the yard. A cute toddler came to the door and tried valiantly to let me in. Soon came the mom, who very graciously agreed to my request and then said, “Hey! Don’t our kids go to the same preschool?” Indeed they do. We’d been at the same school for a few years, but in different classes, so our paths had never crossed directly. We needed a cabbage to bring us together! Now I have a pretty picture of a cabbage and a new friend. Gardens are so great. I knew that sooner or later I would have to start talking about bark. I was hoping that I would find at least a few more colorful specimens to raise my winter spirits before I had to resort to bark, but alas, bark it is. But maybe it’s not such a consolation prize after all. 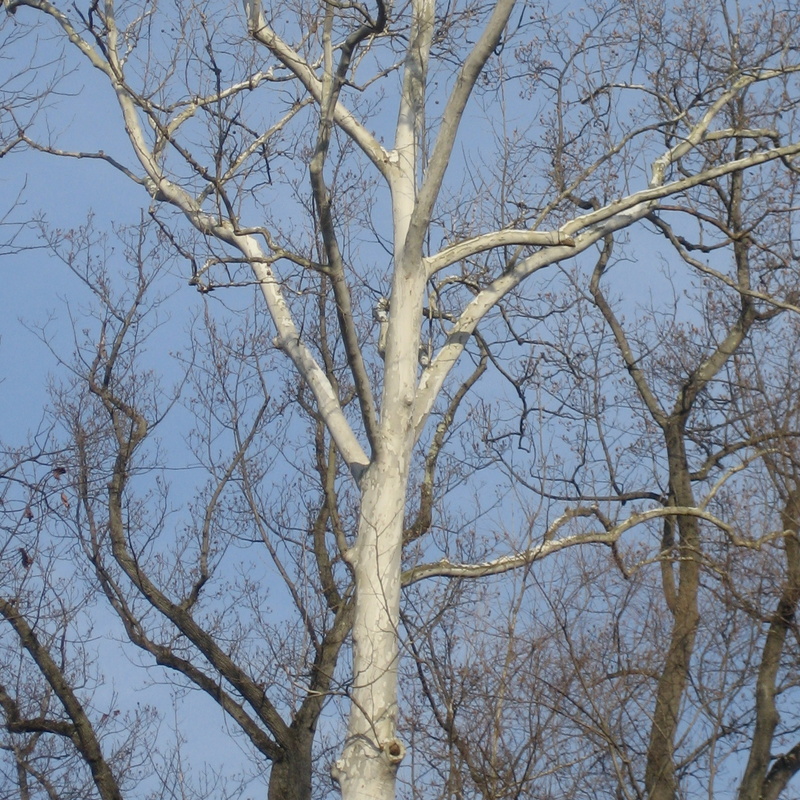 Look at this photo of the birch tree in the woods near my house. I think surely this should count as winter color. White is what happens when all the colors blend together, right? I’d be thrilled with a white rose in my garden in May. A dogwood blanketed in white blossoms defines spring in my opinion. All the gardening books tell you to plant white flowers in your “night garden” because they reflect whatever light is around and brighten up the space. Okay, I’m convinced. The white bark of this towering birch is as beautiful as a blooming rose. Here’s the thing though. This tree is this beautiful all year round. I’m sure that if I stumbled upon it during a summer hike through the same woods, I would appreciate it. Its leaves would shade, its bark shimmer, its grandeur impress. But I might not single it out as the one plant that wins the prize as most beautiful of the day. In the spring and summer, this birch would compete with scores of other plants and flowers, all claiming their own share of my fascination. In winter, the birch gets to be the star. Especially set, as it is, among its gray-barked brethren, it stands out. Washed in the low light of the winter sun, which makes pictures shot at 2pm as beautiful as those shot at dawn, it shines. If not for January, I would have missed the scope of its beauty. Thank God for January. Do I really mean that? I guess I do.